PureAire Essences contain essential oils. 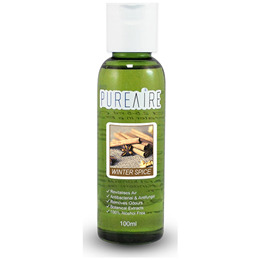 Made from botanical extracts and contain vital oxide disinfectant which has antibacterial and anti fungal properties. They are non-toxic, non-flammable, alcohol free, biodegradable and environmentally safe. Below are reviews of PureAire Air Purifier Essence Winter Spice - 100ml by bodykind customers. If you have tried this product we'd love to hear what you think so please leave a review.